A stretch of window sill and sun are all you need to grow a patch of plump, garnet-colored strawberries. A stretch of window sill, abundant sun, and a little patience are all you need to grow a patch of plump, red strawberries. 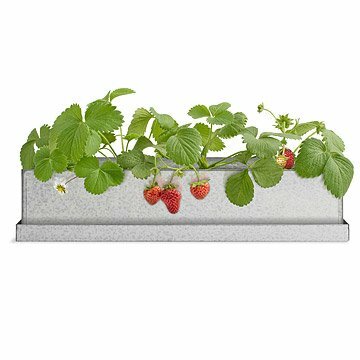 The recycled steel planter sits squarely in your window, allowing the soil to soak up the sun and the organic strawberry seeds it holds to sprout and flourish. Since the kit is made for indoor use, you'll be ready to get growing during any season. Once ripe, your harvest of sweet berries are ready to be picked and baked into pies, ladled onto shortcakes, preserved as jam, or snacked on by the handful. Made in Idaho. Click to see Planting & Care Tips. Click here to check out our Lettuce Windowsill Growbox! Will yield approximately 3-4 pounds of strawberries with proper lighting and fertilization. Sprouting after 7 days woooot! My sister-in-law is beside herself with excitement! Now I must have one for myself. This sits in our window sill in our kitchen. Unfortunately, it'll need to move spots as the it goes since Strawberries need less direct sun in the beginning and more direct sun later on, so we'll have to adjust it's placement later on, but that's not a big deal and definitely worth it because this is adorable and fun. Also, we love strawberries and this helps us have some strawberries more of the year. This was a gift for my mom; she has always loved having berries growing where she can pick and eat them right off the plants! She loves this! I always have the hardest time shopping for Christmas presents for my grandma, so when I saw this I was extremely excited and ordered it right away. It got here in a few days and she absolutely loves it! The perfect gift. We actually live near strawberry fields so I figured these would grow as the climate is right. Nothing grew, seeds didn't even sprout. We grow lots of herbs and have plenty experience gardening. Got this for my wife for her birthday and she was very disappointed when it didn't produce. I would not recommend this product. The planter itself is okay. Good planting space and durable. Nice size for larger windowsill. It only came with 4 seeds so that is disappointing. Sturdy construction and clean appearance! This is great for someone who loves fresh fruit but doesn't have a garden or has a short growing season!